When I survey the acre of land with which we have surrounded ourselves, the oak and ash trees, rhododendron, hollyhock beds, barn, and house, I turn upon all these things a critic's eye, and keep ready to hand the pruning knife, fence hammer, and trim brush. They do not yet appear to me as I see them in my mental eye, and I shape them toward an end which I acknowledge as mine, though I sometimes remember they serve other ends as well. I shape the trees to my own pleasure. But so do children, for whom trees are for climbing. So do birds, whose need is nesting; so also carpenter ants, who must bring nectar to that vast colony somewhere in our eaves. We get, occasionally, a visitor who signed that document twenty years ago. There is a pause as we come, in the "tour," to the wedding certificate in its placeobove the mantel, and there is an almost invariable recognition. The trees, the house in a clearing, an unimpeded view of a mountain, a circling raptor. They smile. I didn't know then, and maybe I don't know now, what the painting meant to those gathered round to hear our vows and sign their names. But it's enough to know they liked it, and still do, and so easily make the connection from it to our present life. Their approval leads me to believe, a little, in my own and Beloved's wisdom: that we could see a way forward, and say so; then having said, follow through. This is prophecy, the oldest art, which also called simply the art of living. Even when the planting and placing of the elements of this vision is done, the vision is not yet attained: what was once seen is still a future glory, which the reality must yet grow into. My hollyhocks just now are two to three feet high, and my vision of them towers over me; in my mind's eye they are seven to eight feet, dropping blooms like small ladies-in-waiting among the clumps of spearmint at their feet. These hollyhocks-to-be, hovering in the air above the current scene, are in a sense the real garden, the garden of the mind toward which the outward garden is progressing. The two gardens will not come together without labor. I intervene by fighting slugs and removing grass and dandelions, and by watering. Beloved does the animals, the upper garden with her lettuces and brassicas and strawberries, and the Front Beds, which are mostly poppies and marigolds this year -- wherever she can tear out enough mint and oregano. She really only likes one, a greenish fan-shaped thing that hits exactly the right width at four feet to sweep a garden row in one slow pass. She bought it over fifteen years, ago and it has spent enough of that time sunning itself on its coils of hose to have faded in color, and it even seems to have lost weight, as though the years of water rushing through have eroded the plastic from within till we handle it like a blown egg. I dread the day that it falls from some unheeding hand and cracks. I like the sweep nozzle, too, for the first five minutes, but then I get restive. It hasn't enough reach, and I'm one of those who stands in one spot dispensing favors near and far. So I generally wind up removing the sweep and hanging it in the crook of the nearest lilac, and put in its place an old fashioned brass nozzle. Antique ones are well made; get one of these. With the brass nozzle you can produce a fine mist eight feet across, or a brave fireman's blast that fans out, forty feet away, just enough to water a distant tree without accidentally digging it up. There's really no better tool for demonstrating the phrase "all-purpose." The only disadvantage to these old brass nozzles that I can discover, but it is a very real one, is that Beloved removes them to re-install her green sweep, and puts them down wherever she happens to be. This can be anywhere on the acre, and I have very bad eyes nowadays. There is one other gadget in this category that we own, and that is a water wand, the kind that is about three feet long with a valve at one end and a nice aluminum rose at the other, on a slender crooked neck. I like the wand very much, at least when working with young plants, because of the so-tiny droplets it produces without choking back the volume of water the way the brass nozzles do. The secret to the wand is to hold it "upside down"; the rose should tip up like a flower (a rose), facing the sun, and its drops should rise into the air and fall by force of gravity alone, gently washing the mulch at the feet of your seedlings. The idea is to imitate, not rain, but a long-necked watering can of the English type, with its brass rose. I drape the hose over my shoulder and wander along, visiting plants and offering them the wash of life at their feet, where it's wanted. It's very meditative, using the wand, because there is no back pressure in the hose. There are times when you want the rain effect of the sweep or the mist of the wand, without losing the flow control offered by the pistol grip mechanism. Because you've bought the one with the threaded barrel, you can simply attach the other nozzles as needed, creating the right tool for the job at hand. I've become fond of attaching just the rose from the wand to the pistol grip nozzle; this results in a gadget that seems exactly what's wanted for perennial herbs and berries. 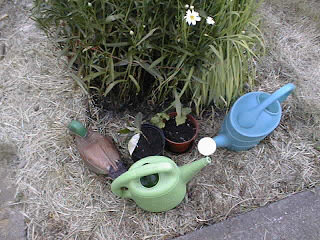 When I walk about, watering with these various implements, it is generally evening. Direct sun will evaporate much of any water offered at mid-day, and in the mornings I'm off to work. Evenings are good for water economy and good for me. I fall into the routine, still noticing weeds that will need attention, or transplants that have stayed overlong in shock, but mostly I'm able to relax and look around. Beloved tucks a bit more straw around her newly transplanted lettuce. Canada geese pass overhead here any time of year, though they are at their most spectacular in autumn; we have also mallards who travel in pairs, one green and one brown, and put down in our goose pen to steal cob and talk to our Khaki Campbells across the fence. A swallow sits on the clothesline in his green dinner jacket and scolds me for getting too close to the birdhouse on the potting shed wall. The moon rises, sullen and red-faced at first, then brightens as night comes on, and the last of the sun sweeps up the face of Jasper Mountain and disappears where there will soon be stars. It is altogether restful to water a garden by hand if you have the time. Take your garden's advice: forget the evening news and the sitcoms. Make the time.